Since the dawn of man, people have gathered around fires. Fire has protected us from wild animals, kept us warm, and cooked our food. While most of us no longer need protection from wild animals, a back yard fire pit can be a great place to keep warm on a chilly night, roast weenies and marshmallows, or just relax and enjoy a quiet conversation with your family and friends. There are two kinds of fire pits, enclosed and open. If you decide on an open fire pit, place it in an area that is free from overhanging tree branches. 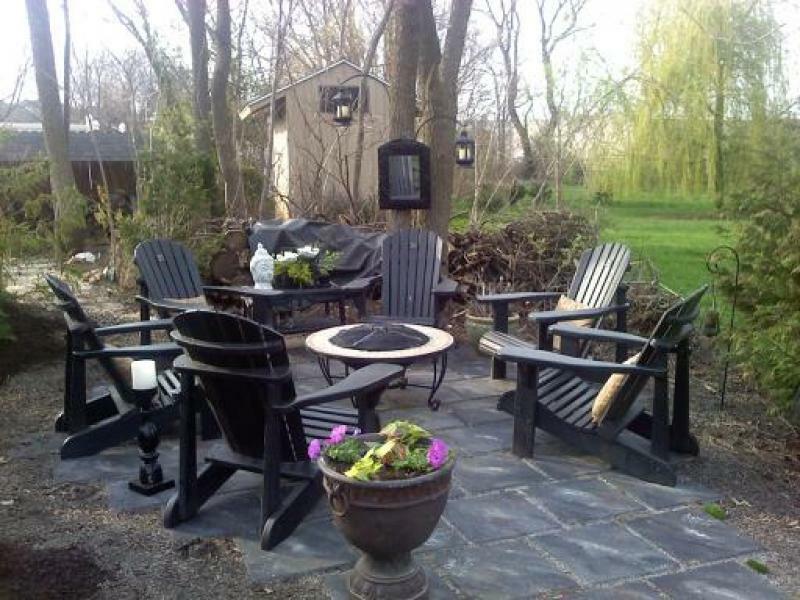 You should also make sure that your fire pit is protected from wind. If you live in an area that is prone to dry summers and wildfires, be especially cautious to place it away from dry brush. Place it near a source of water, or keep a fire bucket nearby that you can reach quickly to prevent accidents from getting out of hand. And never use a fire pit when strong or gusty winds are blowing. Fire pits can be elegant and elaborate or simple and store-bought. This elaborate fire pit was professionally designed and constructed. The brick work is an ideal surface on which to set chairs for your guests, whether it be a simple barbeque or a large party. For a really fun, informal large party, why not dig a large open fire pit to cook in? Just fill it with coals, cover it with banana leaves and you can have Hawaiian with a roast pig, go Greek with a roast lamb, or even make it Middle Eastern with a whole goat! Either way, you can get your guests involved for a fun activity. Theyll love to pitch in to help prepare, cook, and dig up their own dinner! If that all sounds like too much work to you, you can still enjoy the benefits of fire with a store-bought pit like the one shown below. Both open and covered fire pits come in several sizes. Some simple assembly may be required. You can use charcoal, wood, or specially prepared fireplace logs for fuel. All you have to do for a fun time is provide the marshmallows, graham crackers, and chocolate bars and let your guests make their own delicious smores. We may not need protection from wild animals any more, but we still need warmth, a place to cook, and companionship. A back yard fire pit can provide all of these. On a cool summer night, you can even gather round the fire in your own back yard and tell ghost stories. Who knows, one of your friends might even be the next Stephen King!